Exploring Niagara Falls with kids is amazing! This region is ripe with incredible family-friendly attractions. 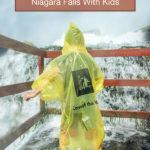 Niagara Falls is just an hour from our home, and we seem to always find ourselves looking for amazing things to do in Niagara Falls with kids. 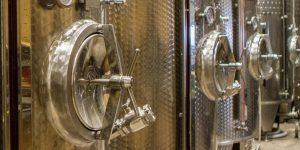 Whether we are on one of our epic New York State road trips or traveling up the 401 to Toronto or Ottawa, it seems like family-friendly activities in Niagara Falls always end up on our radar. In fact, our eldest son constantly questions us if we will be doing a family trip to Niagara Falls for his birthday each year. And usually, if we aren’t on one of our epic trips around the world, we make our way back to see what’s new in Niagara Falls this year. So, if you’re looking for the best things to do in Niagara Falls with kids this year, strap in and hang on tight, because there’s a world of adventure to be had! Because of the proximity of Niagara Falls to amazing towns like Rochester, Buffalo, Toronto, and Niagara-on-the-Lake, it’s easy to get sidetracked with all the things to do near Niagara Falls. But for this article, we’re going to stick to the Falls and the two towns on either side of the border. Because there are more than enough things to do in Niagara Falls with kids here. There are two sides to Niagara Falls, the American side and the Canadian side. If you are hoping to visit both, you’ll need to bring passports for the family. There are certain cases where young children can cross with just a birth certificate but the border rules are always getting more strict. It’s always better to be safe than sorry. 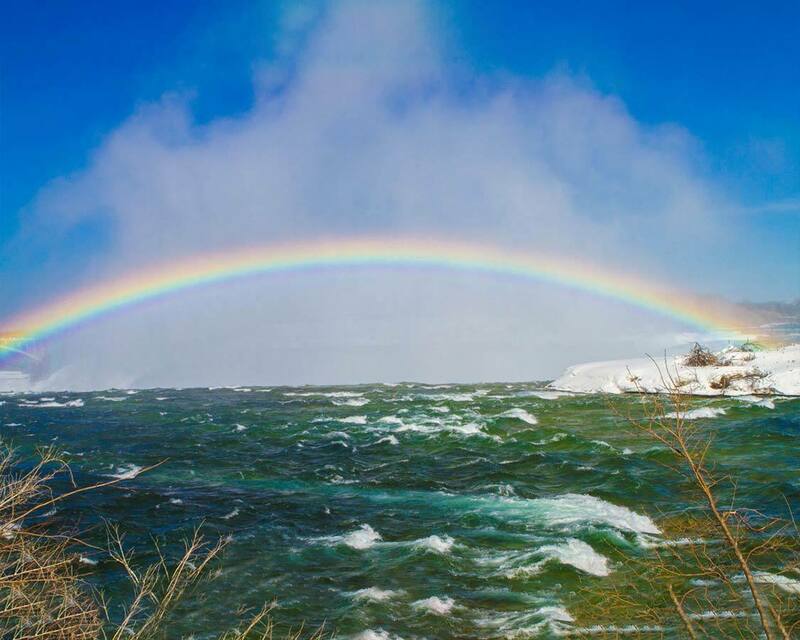 You can check out which side of Niagara Falls we love the most here. We’ll focus here on what to do when visiting Niagara Falls during the summer. It’s the most popular time of year to visit Niagara Falls with kids. That’s not to say that Niagara Falls in winter is bad. In fact, as you can see here, Niagara Falls in winter is pretty awesome. But for this article, we’ll just focus on summer attractions in Niagara Falls. 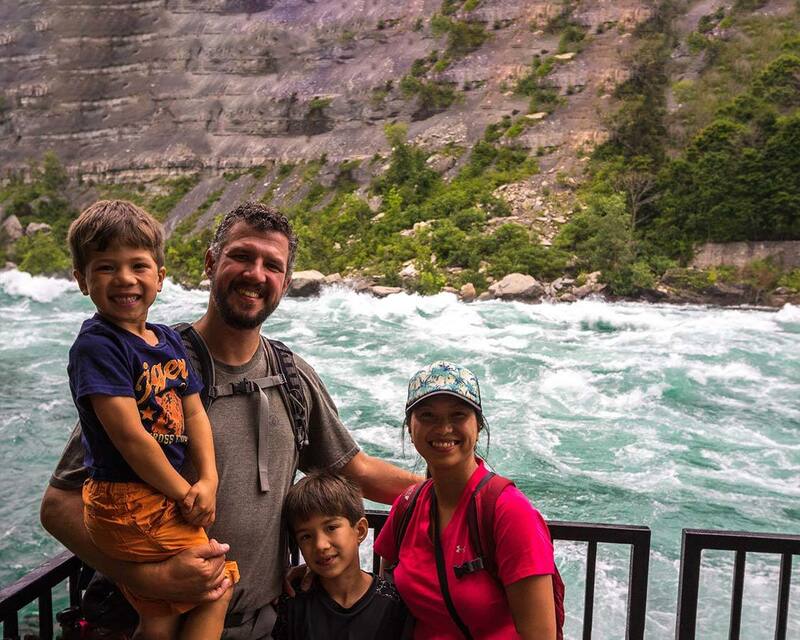 You don’t need to empty the bank to set up your family travel to Niagara Falls packing list. Most of the attractions in Niagara Falls are pretty straightforward. 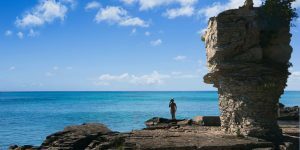 However, there are a few things you don’t want to leave behind or you may end up paying inflated tourist area prices to pick them up in town. Dress in layers. Summers in Niagara Falls can get pretty hot. It’s not rare for temps to go higher than 30 C (86F) in July and August. However, if the sky clouds up, or the mist from Niagara Falls is really spraying, things can cool down. Make sure you have a long sleeve shirt and pants on hand just in case. You should also make sure to pack sunscreen to keep the hot summer sun at bay. If you plan on taking in some of the amazing hikes in Niagara Falls, bring a decent pair of running or hiking shoes. Your ankles will thank you. It’s also a good idea to bring a pair of flip flops, especially if you’ll be doing some of the up-close an personal experiences at Niagara Falls with kids. They often supply flip flops, but the quality and fit aren’t great, especially for kids. Our kids love their croc sandals and bring them everywhere they can. Bringing a light rain jacket for Niagara Falls is also a good idea. There is a LOT of spray from the falls, especially if you are doing some of the closer attractions. You will get wet. For a lot of people visiting Niagara Falls with kids, the Canadian side is where it’s at. It has the theme parks, the wild rides, the best views. If you’re looking for which side of the falls to visit for the wildest experiences, the Canadian side should grab your attention. But, it’s not all haunted houses and Ferris wheels in the land of the maple leaf either. 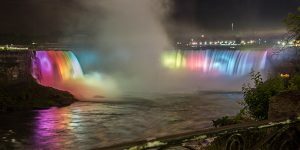 There is a huge variety of things to do in Niagara Falls Ontario outside of kitschy attractions. You can save some money on your Niagara Falls Canada attractions by picking up the Niagara Adventure Pass. There are two Niagara Falls cruises, the Hornblower and the Maid of the Mist. Both are essentially the same experience, but the Hornblower leaves from the Canadian side of the falls near the visitors center while the Maid of the Mist departs from the American Side below the viewing platform. Both cruises take you along the edge of the American Falls and Bridal Veil Falls for some epic views. 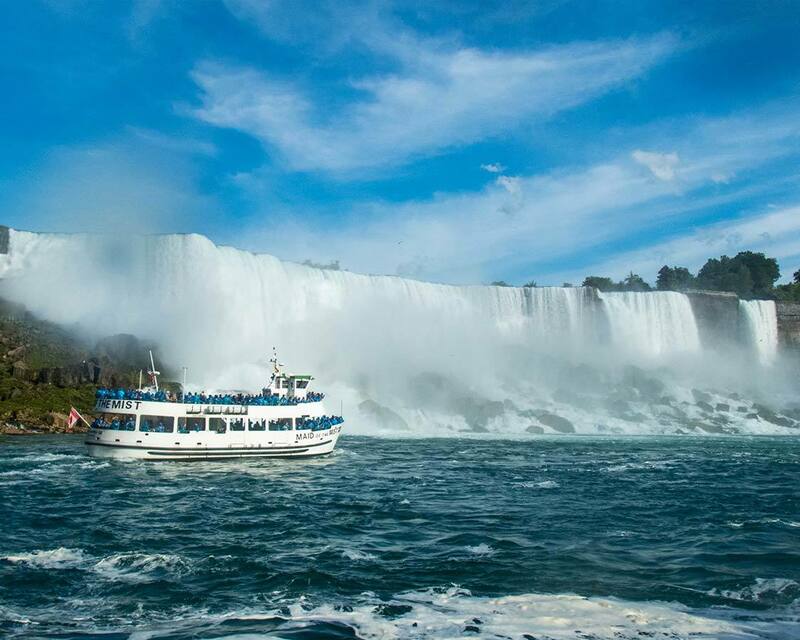 Then riders on the Hornblower and Maid of the Mist cruises are brought to the base of the epic Horseshoe Falls where the “mist” part really comes into play. If you take the Niagara Falls cruise, you will get soaked. The rain jackets are merely a formality to help you protect any precious electronics. But there is so much water pouring down the falls that it will find every crack and crevasse and fill it with clear Niagara water. I recommend bringing a waterproof pouch for your phone or camera if you are doing the Niagara Falls cruise with kids. The Journey Behind The Falls is one of the classic Niagara Falls attractions. It’s an easy, guided, or self-guided walk into the tunnels dug out by the Hydro companies that have harnessed the massive power of the falls to generate much of the power for southern Ontario and northern New York State. This 30-45 minute tour includes a visit to the 13-story Niagara observation deck. Visitors to the Journey Behind the Falls in Niagara can also explore the series of 130-year-old tunnels directly behind the Horseshoe Falls in Niagara. Just a warning though, you will likely get wet. 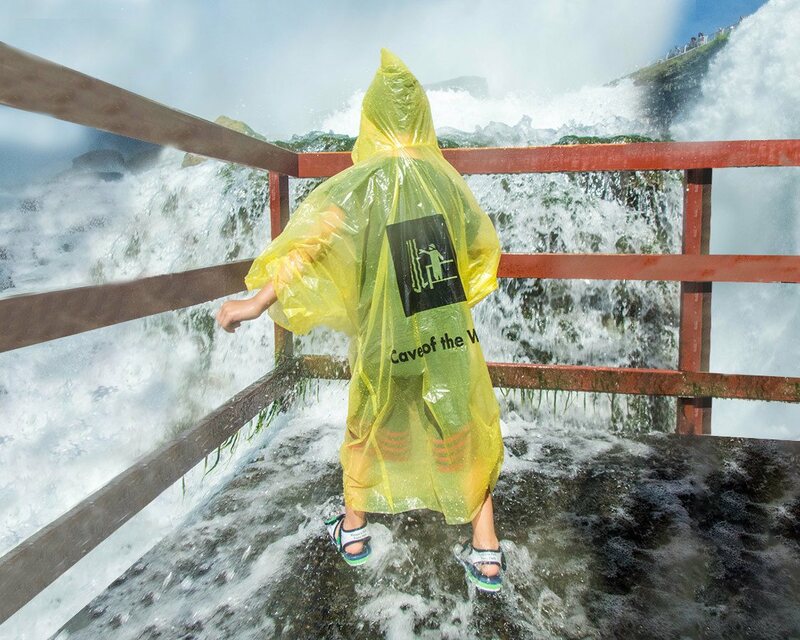 So if you’re doing the Journey Behind the Falls in Niagara Falls with kids, make sure you have a rain jacket or change of clothes handy. 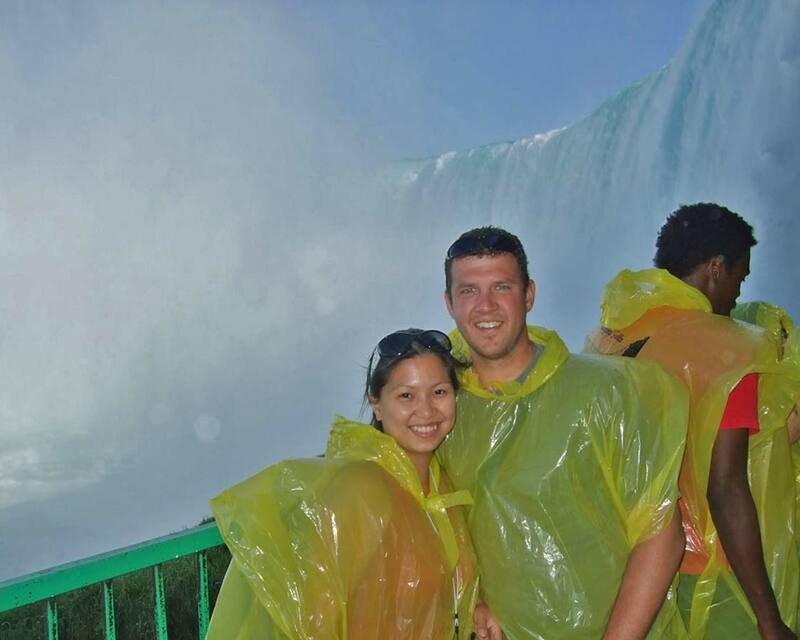 The Journey Behind the Falls is another attraction covered by the Niagara Adventure Pass. This attraction isn’t as thrilling as the Cave of the winds on the American side, but it is the closest you can get to the falls on the Canadian side. I always recommend a visit to the Niagara Falls Butterfly Conservatory for those bringing family to Niagara Falls. Taking a stroll among the colorful butterflies is like a trip through a magical flying garden. 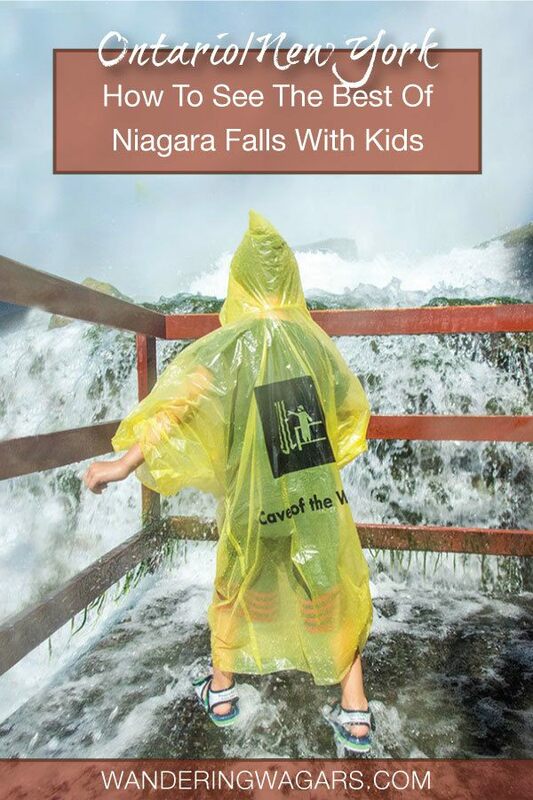 And it will be sure to delight parents visiting Niagara Falls with children. A visit to the Niagara Parks Butterfly Conservatory is also included in the Niagara Adventure Pass. 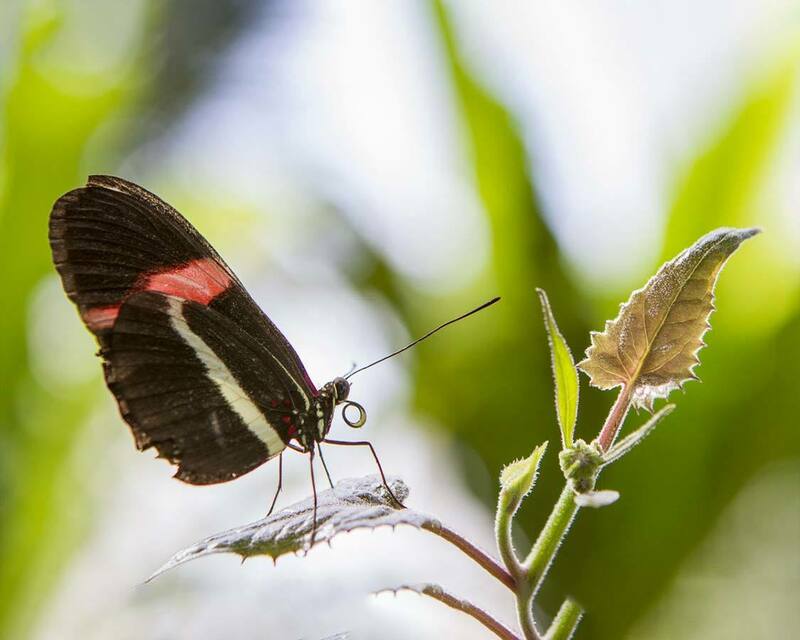 You can find out more about the Niagara Falls Butterfly Conservatory here. The Niagara Falls Bird Kingdom is another great attraction covered by the Niagara Adventure Pass. 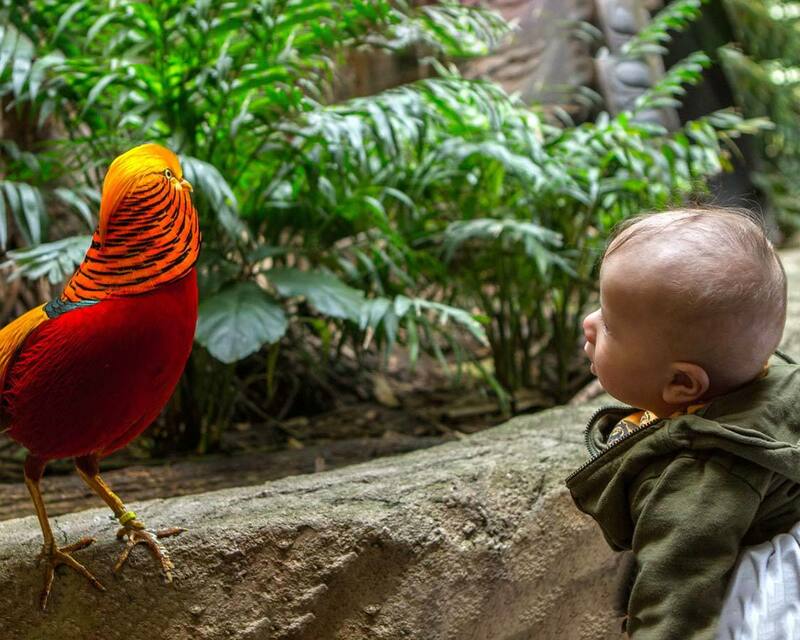 The Bird Kingdom Niagara Falls is a fantastic family-friendly Niagara Falls attraction. The Niagara bird aviary is three floors of fun that include up-close encounters with reptiles, bats, turtles and more. Bird Kingdom Niagara Falls also includes one of the most beautiful aviary attractions we’ve experienced. A Niagara Adventure Pass lets you experience waterfalls, rock walls, and beautiful foliage. And the whole experience is filled with thousands of birds flying all around. You can find out more about the Niagara Falls Bird Kingdom here. The White Water Walk along the edge of the Niagara Gorge is the best place to experience the power of some of the roughest Class-6 rapids in the world. The walk takes you on a lift to the base of the cliffs where you can walk on an easy (and safe) boardwalk. Here you can see how the waters of the Niagara River go from calm and clean to a roaring terror of foam in just a short distance. Children in Niagara Falls will love seeing the epic waves tossing up and down just a few meters from the relaxed boardwalk. Along the way, there are interpretive platforms and plaques talking about the unique geology, plants, and animals that live in the Niagara Parks. If you want to get up close and personal with the Niagara Falls Rapids, but don’t mind getting a little dirty, a visit to Niagara Glen Nature Area is a must. The Niagara Glen nature area is just a short distance down the road from the White Water Walk, but the experience here couldn’t be more different. The Glen hiking trails are accessed from a picnic area off of the Niagara River Parkway. From here you must take a long set of stairs to the base of the gorge. The Niagara Glen is one of the most unique places in Ontario. At the base of the cliffs, the vegetation becomes lush and reminds me more of our travels in the rainforests of Costa Rica than of anywhere else in Canada. You can follow the trails that spiderweb throughout the forest and get right up close with the Niagara rapids along the way. But watch your step and make sure to wear shoes with good tread here. The ground can be very slippery. 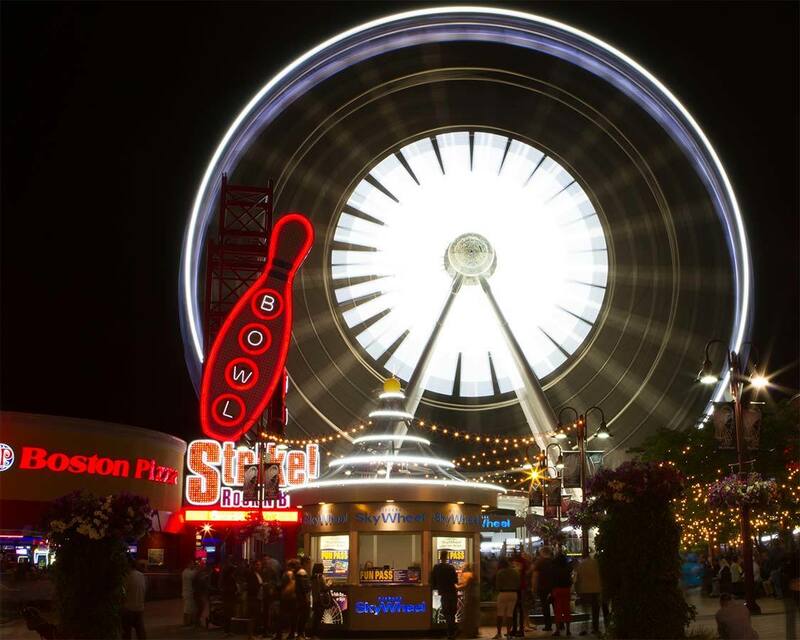 Clifton Hill is the center of fun for families in Niagara Falls. Kids will love the series of haunted houses, mini-golf courses, arcades, mirror mazes, upside-down houses, the Mario-Kart style Niagara speedway and much more. Visiting Clifton Niagara Falls for kids is like combing a whole bunch of theme parks into one wild ride. Clifton Hill is a place we try to skip when we are in Niagara Falls, just because it’s so overwhelming. But it’s also a place that will drag you in (sometimes kicking and screaming) and then you’ll find yourself caught up in the fun. It’s easy to spend an entire day or more at the Clifton Hill attractions in Niagara Falls alone. But bring your wallet, because it can get expensive. You can save some money on the Clifton Hill attractions with the Clifton Hill Fun Pass. 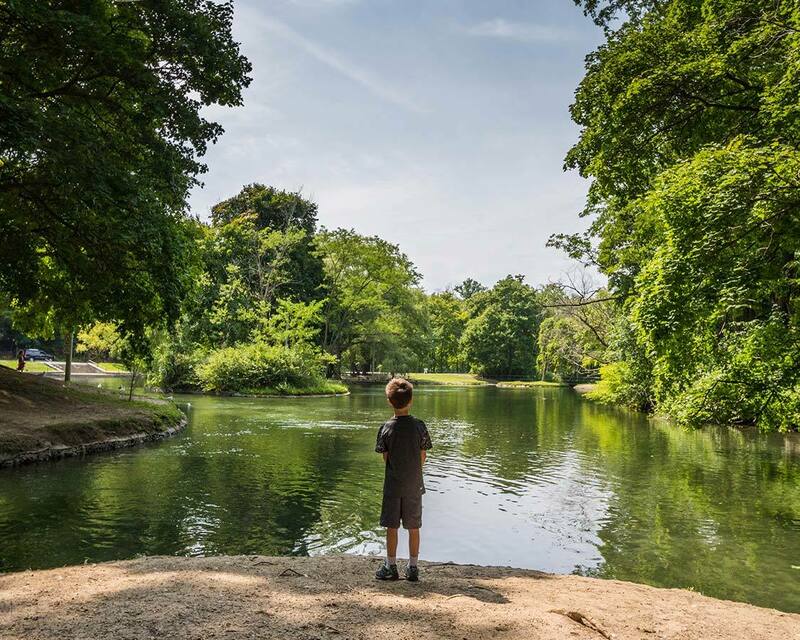 Dufferin Islands Park is one of our favorite places to picnic in Niagara Falls with kids. This peaceful 10-acre park is a wooded paradise with small, stone footbridges connecting dozens of small islands. There are many birds and small animals that make the park home, so it is always teeming with life and excitement. Kids in Niagara Falls Ontario will have a blast watching the fish off of the island ledges, chasing squirrels around the huge willow trees or just relaxing in the shade while enjoying some munchies. 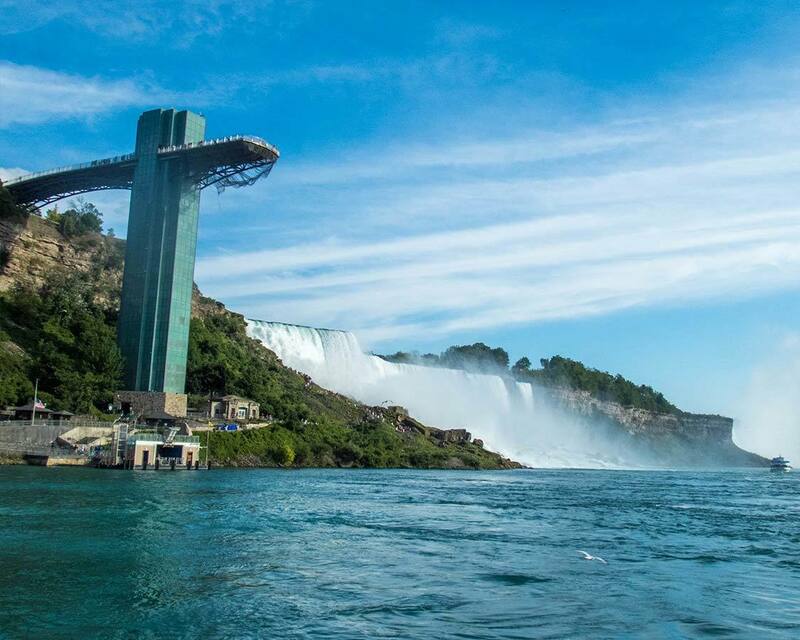 The Niagara Falls Zipline is one of the newest Niagara Falls attractions. Kids in Niagara Falls over 7-years old can ride the Mistrider Zipline run by Wildplay Niagara along the gorge, past both the Bridal Veil and the American Falls to a platform 670 meters (2,200 feet) away. The Mistrider Zipline isn’t a thrill-a-minute high-speed trip though. In fact, the Niagara Falls Zipline is one of the most relaxing ways to experience Niagara Falls. Plus, you won’t have a busload of tourists blocking your view! I did the zip line with a few of my fellow travel writer friends from our web series Wait, What!? You can check out the video for that below. You can find out more about the Wildplay attractions here. Queen Victoria Park is a large tree-filled park just across from the Table Rock Center and Niagara Falls Visitor Centre. 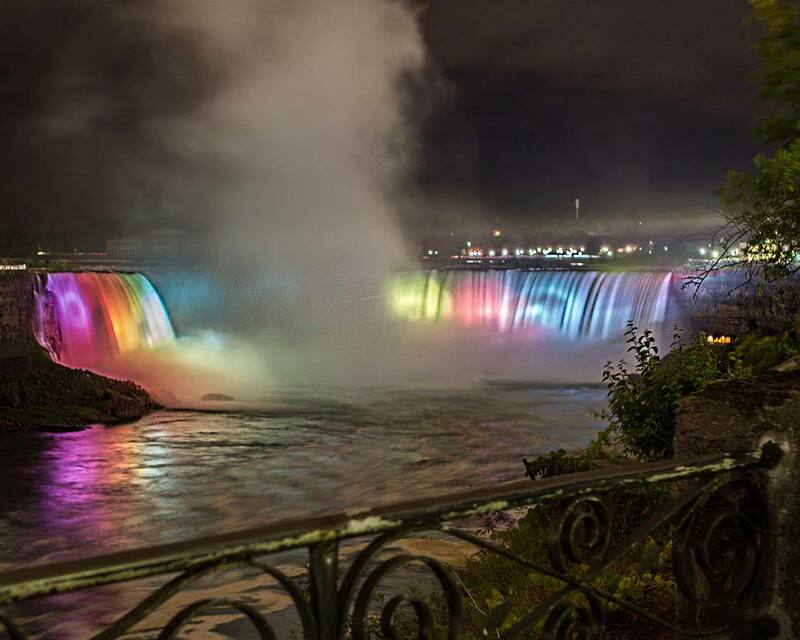 During winter in Niagara Falls, this is the heart of the yearly light show. But during the summer it is a serene, shady area that many people visit as a relaxing break from the crowds across the road. Within Queen Victoria Park is the Floral Showhouse, a 70-year old indoor botanical garden. Kids will flip over the indoor waterfall and toy train snaking through the floral displays. Everyone will love the delicious smells and a relaxing atmosphere. The Niagara Parks Botanical Gardens, which are just past the Butterfly Conservatory off of the Niagara Parkway, is a 99-acre garden that is one of the best places for a relaxing stroll during summer in Niagara Falls with kids. The Botanical Gardens feature everything from vegetables to over 2,400 roses throughout the accessible trails. If you are looking for a unique view of Niagara Falls with children, the Whirlpool Aero Car is a great option. 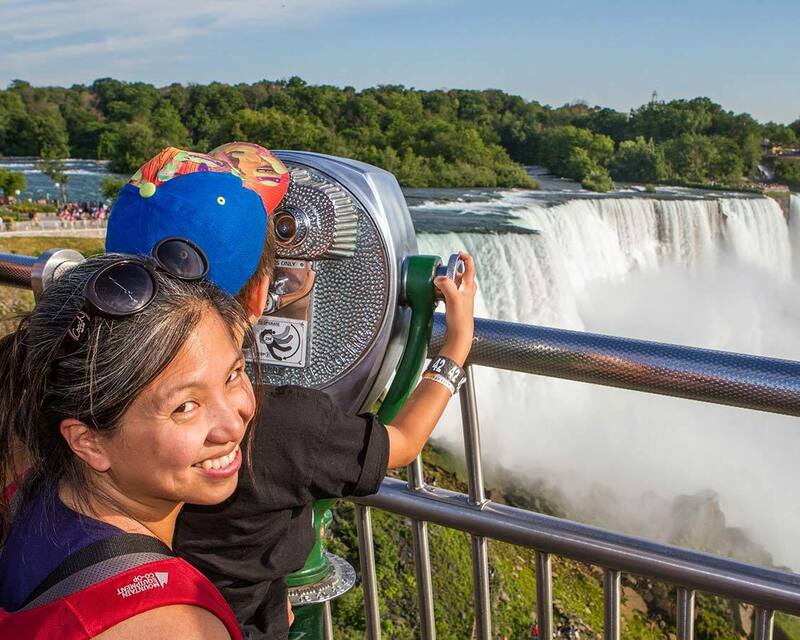 This Niagara Falls attraction is open to any age, those 5 and travel for free. This 100-year-old attraction is a cable car that spans Niagara Gorge overtop of the swirling Niagara Whirlpool. The round trip takes about 10-minutes. You can book the attraction here. If you’ve had enough of the outdoor fun in Niagara Falls with kids then a trip into the Fallsview Waterpark is a great way to spend a day in Niagara Falls. Although it can get busy, especially during the weekends, the Niagara waterpark is a great place for families in Niagara Falls. 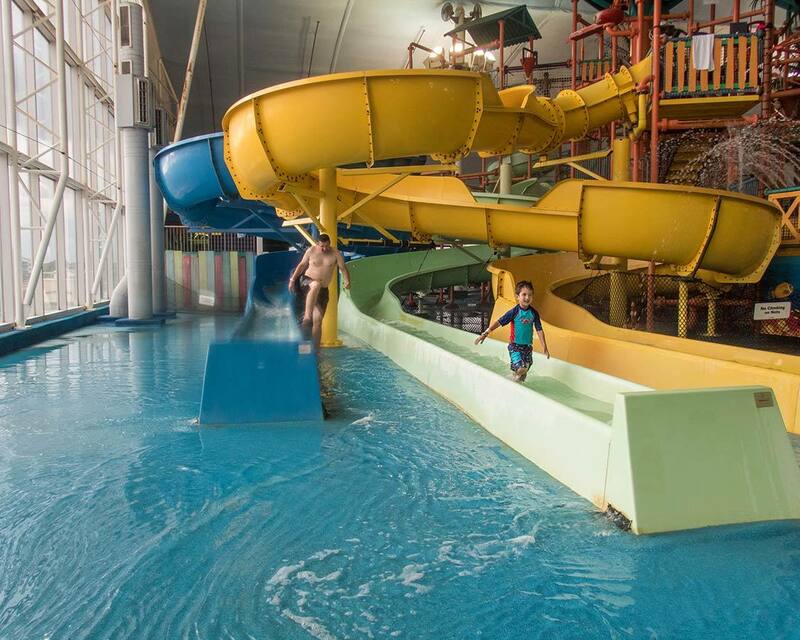 The waterpark has a collection of waterslides, tubes, splash zones and much more. You can often find deals paired with the attached hotels like the Crowne Plaza Fallsview. There are some amazing family-friendly hotels in Niagara Falls Ontario. Some offer incredible views of Niagara Falls, while others have great amenities that are perfect for those visiting Niagara Falls with kids. Great Wolf Lodge Niagara is one of the most popular hotels in Niagara Falls for families. This theme-style hotel combines activities, a waterpark, and even themed rooms that are perfect for a relaxing family getaway. The Crowne Plaza Fallsview has great rooms, especially the family-style suites. Many of the rooms have excellent views of the Horseshoe Falls. The Crowne Plaza breakfast buffet also offers one of the best restaurant views of the falls. For something classy yet, family-friendly checkout Brasa Brazilian Buffet on Fallsview Blvd. This restaurant has an incredible selection of Brazilian-themed foods, meat served and carved at the tables, and there is often engaging live-music that really fills in that Brazilian vibe. You can check out their site here. You can also get your Mediterranean cuisine fix at Kasbah on Dunn St. They have a unique take on farm-to-table cuisine that keeps things local, but still transports your taste buds to the clear coastal waters of the Mediterranean Sea. You can find the details for Kasbah here. 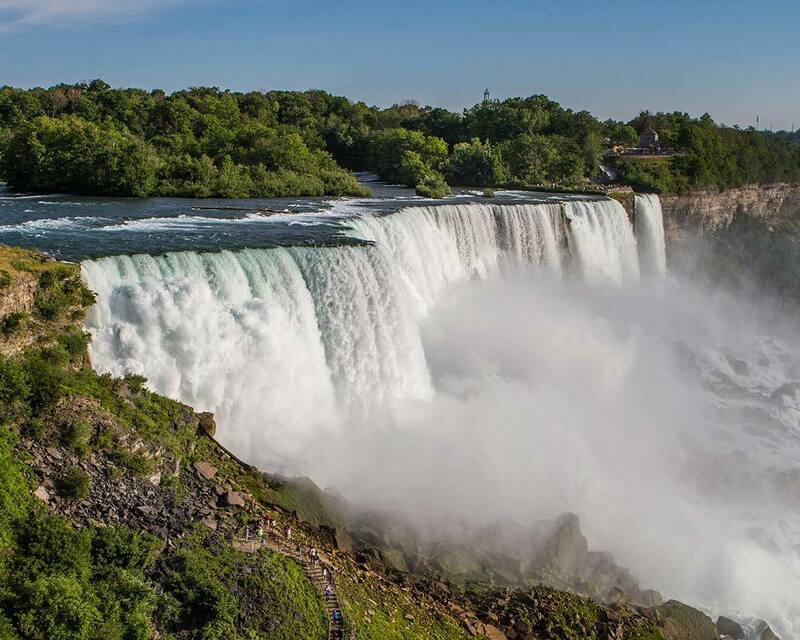 The American side of Niagara Falls has its own fair share of incredible attractions. One way to save some money while you explore is to pick up the Niagara Falls USA Discovery Pass. It offers admission and discounts on a number of things to do in Niagara Falls NY such as Cave of the Winds, Maid of the Mist, Aquarium of Niagara, Niagara Adventure Theater, the Niagara Gorge Discovery Center and unlimited rides for the day on the Niagara Scenic Trolley. The cave of the winds is the American equivalent to the Journey Behind the Falls. But, it’s SO MUCH BETTER! The Cave of the Winds allows very close access to the falls. You can literally walk up along the boardwalk and touch the edges of the Bridal Veil Falls at the base of the Niagara gorge. There is no more epic experience in Niagara Falls for kids than this. The elevator ride takes you down 53 M (175 ft) then you walk through a tunnel which leads to a view of the Niagara Gorge. Next, you ascend via a series of wooden steps. The higher you go, the wetter you get. Our eldest son, at 6-years-old, particularly enjoyed the top level also known as the Hurricane level. The American Side is not blessed with the most naturally epic views of the Falls. So, in typical American-style, they simply built one. The Niagara Falls Observation Tower, or Prospect Point Observation Tower, is the jumping on point for the Maid of the Mist cruise. 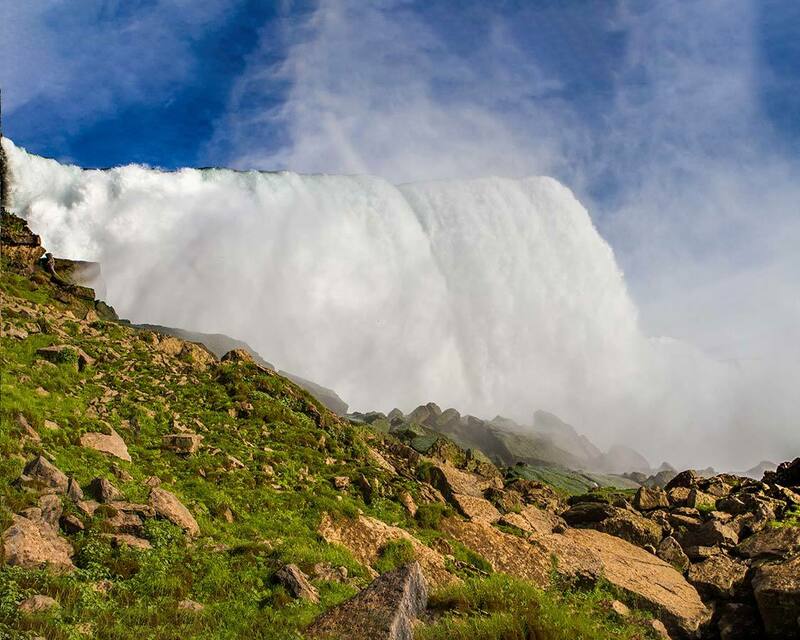 It also offers one of the best views of both the American and Horseshoe Falls from the US side of Niagara Falls. Over 8-million people a year visit the observation tower in Niagara Falls. 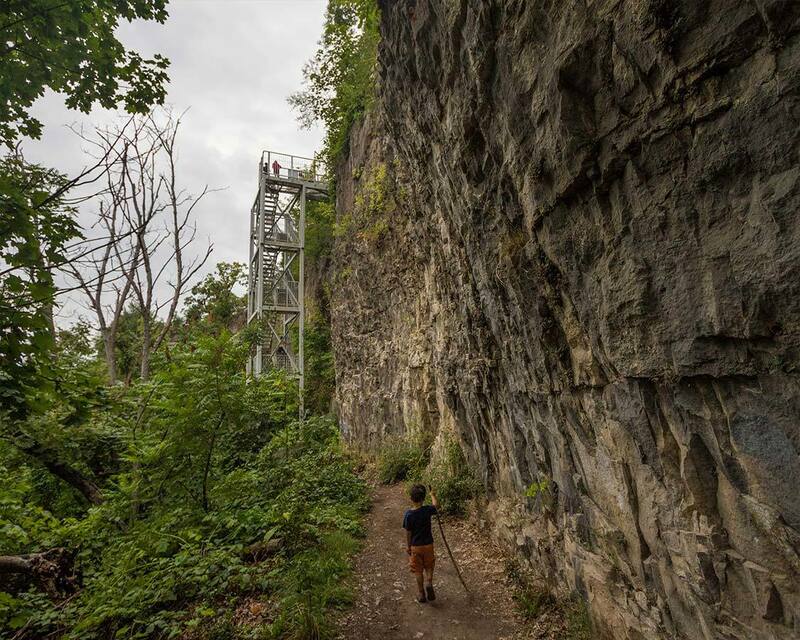 To access the Niagara Falls boardwalk and the Crow’s Nest, walk along the gorge away from the Observation Tower and towards the falls. We climbed a series of steps that lead to the observation area called Crow’s Nest. The stairs and platforms are narrow for the number of visitors that make the walk along the river here. We ended up having to take our time as we waited patiently for the throngs in front of us to finish narrating their Instagram stories. But, the views are excellent. You don’t quite have the access or ambiance of the Niagara Glen, but it’s a great way to see the Niagara Falls for families. Niagara Falls State Park is the oldest state park in the United States. The park not only contains the incredible American and Bridal Veil Falls but also beautiful trails and some of the best views of the Falls from the American side. The park contains key Niagara Falls attractions such as the American and Bridal Veil Falls, the observation platform and more. The area around Goat’s Island is particularly beautiful. This is a small island dividing the American Falls and the Bridal Veil Falls. It’s also where you enter for the Cave of the Winds tour. You can read more about the attractions at Niagara Falls State Park here. The Aquarium of Niagara is just a short walk from the Niagara River. This small but well-stocked aquarium houses Humboldt Penguins (like the ones that we saw in the wild in Punta Tombo, Argentina), California sea lions (like the ones we visited in San Francisco), sharks, turtles, sea horses and more. The Aquarium of Niagara is also very active in wildlife and domestic animal rescue of all kinds. This alone makes it worth visiting the Aquarium in Niagara Falls with kids. You can find out more about the Aquarium of Niagara here. Devil’s Hole State Park is a small park just north of Niagara Falls NY. Within the borders of the park are the cool Devil’s Hole Rapids. It’s a great spot for fishing, and the stone staircase and gorge make it a pretty awesome outdoor experience for kids in Niagara Falls NY. You can find out more about Devil’s Hole State Park here. There are some amazing family-friendly hotels in Niagara Falls New York. The Niagara Falls NY hotels don’t have the views of the Falls that the Canadian side does, but that doesn’t mean that there aren’t great family-friendly amenities. The Wingate by Wyndham has an indoor pool and hot breakfasts. It’s a popular hotel for families in Niagara Falls. NY. The Seneca Niagara Resort and Casino is close to Niagara Falls State Park and the Falls. If you don’t mind staying in a casino atmosphere, this hotel has some great pools and restaurants for families. If you’re looking for some great family-friendly food in Niagara Falls NY, you’re in luck. There are some excellent restaurants in Niagara Falls that are excellent for families. The Top of the Falls restaurant on Goat Island in Niagara Falls State Park is a popular restaurant offering typical American fare with great views of the Falls. 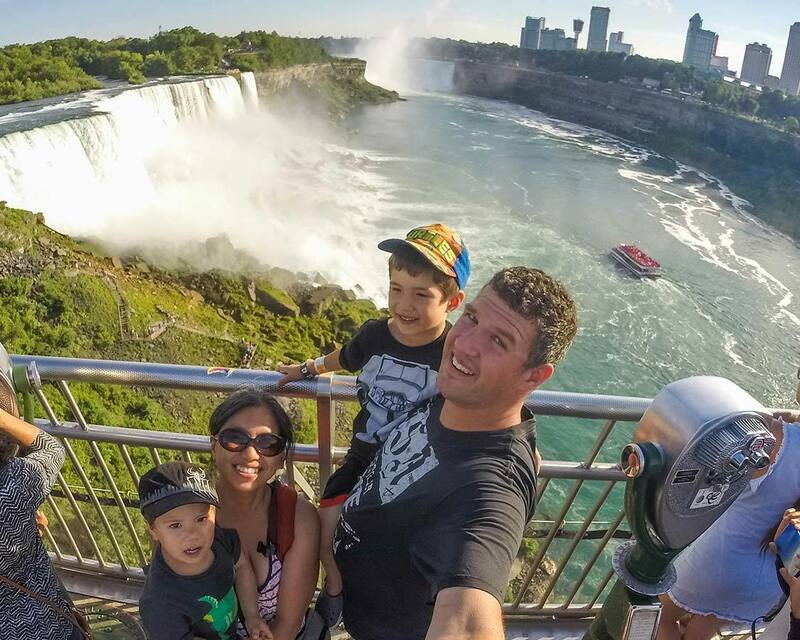 Have you ever visited Niagara Falls with kids? Drop us a comment to tell us about your experience. Or, head over to our Facebook page and share a photo of your trip. We would love to share in your travels. This is great! I want to bring the kids to Niagra and I love all the tips and info. Pinning for later!! Thanks for the great tips. That is a great help for those visiting the park when it’s at it’s busiest.